The Dresner Advisory Services Industry Excellence Awards honor BI vendors that stand out from the crowd in the products and services they deliver to their customers. 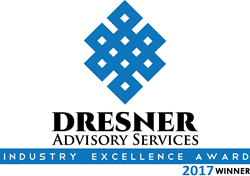 Dimensional Insight, a developer of business intelligence (BI) solutions for complex and highly regulated industries, today announced that it has been named a winner in Dresner Advisory Services’ 2017 Industry Excellence Awards. The awards are given to vendors that achieved high rankings in the Customer Experience and Vendor Credibility market models within the company’s annual Wisdom of Crowds Business Intelligence (BI) Market Study. The annual Wisdom of Crowds BI Market Study is based on data collected from end users and provides a real-world perspective on current and future BI market trends. The Customer Experience model within the study considers the real-world experience of customers working with vendors’ BI solutions on a daily basis, plotting sales and service touch points against customer sentiment. The Vendor Credibility model considers a vendor’s relationship with customers by plotting the price-to-value as a “confidence” score comprised of integrity and recommend measures. Dimensional Insight is being recognized for its “overall leader” ranking in these categories within the 2017 study. The “overall leadership” award recognizes vendors within the Wisdom of Crowds BI Market Study who demonstrated excellence across all categories of measurement, including product/technology, sales and service, value, and confidence. Dimensional Insight’s overall leader ranking is also included within the 2017 Wisdom of Crowds BI Market Study Buyer’s Guide Edition, which compares and contrasts BI vendor products across 25 feature sets and traditional, cloud, and mobile platforms. To view this year’s guide, visit: http://biwisdom.com/.